BIG CAPACITY - With 2 separate compartment, The spacious pocket is roomy enough to hold cellphone, passport, ticket, small purse or other valuable items. With the small pockets in the front, you could put your keys, coins, cashes in it to protect your cell phone from scratched. You will never feel bulky with it. 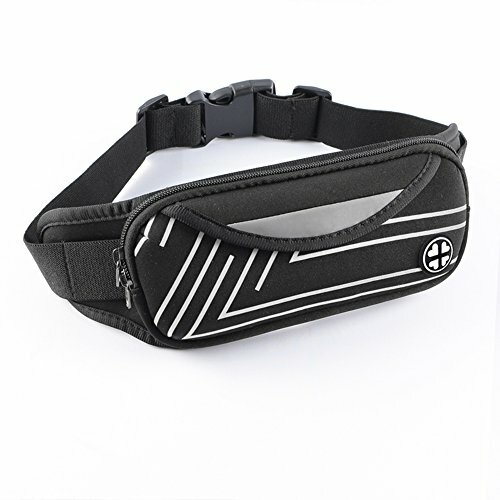 STRONG FLEXIBLE ADJUSTABLE BAND - Strong flexible belt-keeping this waist/chest/shoulder bag fanny pack in position when walking exercising.The strap is widely adjustable for most waist size(20\"-43\"), suitable for men and women. And the special designed buckle-Avoid Finger Clipping by accident. HANDS FREE - This is a well-made waist pack bag. Perfect for most people want to be hands free. it can be carried like a chest bag, a waist bag, a cross body bag. Good for hiking, vacations, bike rides, gym, running, walking in the park with the dogs, festivals, raves, Disneyland trip, music festival, amusement park, theme parks,etc most outdoor activities or recreation. UNIQUE DESIGN - EARPHONE HOLE and WATERPROOF, Easy to listen music while sporting with the well-designed earphone line hole. made from superior polyester fabric Water resistant material, no water and sweat into bag. WELL COMPATIBILITY - Looks slim but large enough to carry iPhone X, iPhone 8/8 Plus, iPhone 7/7 Plus, iPhone 6/6S Plus, Samsung Galaxy S9, S8, Samsung Galaxy S7/S7 Edge and all devices up to 6.2 inches and ID, credit cards, cash, keys and other essential items.